I’ve observed on this blog once or twice before that so-called progressive rock (or “art rock”) developed in order to assuage pop guilt. The founding work of the movement is no doubt the Beatles’ heavily engineered Sgt. Pepper’s Lonely Hearts Club Band (1967), although some would argue that the Beach Boys’ Pet Sounds (1966) is the foundational work. Either way, both of these albums were made with “high” or “serious” aspirations as opposed to mere “pop” aspirations, thus making them, among other things, acutely self-conscious examples of rock music (isn’t self-consciousness a characteristic feature of a so-called guilty conscience?) As a frequenter for many years of garage and yard sales and record conventions, as well as the used record bin at my local Goodwill store, I remember a time when you couldn’t give away albums from the art rock camp, e.g., Supertramp, 10cc, The Moody Blues, Genesis, King Crimson, Electric Light Orchestra, Yes, and Emerson, and Lake and Palmer on the British side, or Kansas, Styx, and Boston on the American. By the early to mid-1980s, many of these bands, and others, of course, representing the art rock movement, were considered “dinosaurs,” that is, extinct giants that once walked the earth. And if not yet extinct, certainly déclassé, because by the 1980s many critics considered these bands’ best work was behind them. But new media technology developed for systems such as the Xbox—the Rock Band and Guitar Hero series of games, for example—has introduced the music of these antique bands to a new, younger audience. As Marshall McLuhan observed decades ago, the content of the new media is the old, and the music contained on Rock Band (and Rock Band 2) are good examples of this insight. I was reminded of McLuhan’s observation the other day when I heard my son John (sixteen years old) playing his Xbox guitar along with Kansas’ “Carry On Wayward Son,” a big hit when I was, alas, not a whole lot older than he is now—in my early twenties. I believe John happened to be playing Rock Band 2, but the song is also on Guitar Hero II, or so I’ve been told. 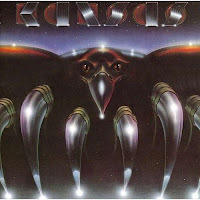 There is, perhaps, no better example of a Seventies-era arena rock dinosaur than Kansas. To lift a phrase from Michel Foucault, Kansas is a band that lives in the Seventies as a fish lives in water, that is to say, it can live nowhere else. The Beatles had shown that a rock band could sell out a stadium, and the subsequent rock festivals of the 1960s, and the so-called “arena rock” of the 1970s (a term used in lieu of “stadium” since not all rock concerts were held in them) rode the massive wave—tsunami—the Beatles had created. The American counterpart to British bands such as King Crimson and Yes, Kansas, being Midwestern, was perceived as less innovative (“derivative”) than these bands, but the band was composed of six viable, hard-rocking musos nonetheless—who unfortunately never quite understood the valuable cultural cachet of the album cover, as Yes, for instance, with its arty SF/fantasy covers by Roger Dean, did. (The cover for Kansas’s first album was taken from the Modernist mural painting of John Brown in the Kansas state capital painted by John Steuart Curry.) The band’s first album, the eponymously named Kansas, was released in 1974. The last album featuring the original band members, Audio-Visions, was released in 1980. During those seven years the band released eight albums, one of them, Two For the Show (1978), being a double LP live set. Soon after the release of Audio-Visions, the band began drifting apart. A couple members became born-again Christians, and through the 1980s the band was known primarily as a Christian rock band, and never again had the popular success it did during the years 1974-80. The band’s biggest charting single, “Dust in the Wind” (“All your money won’t another minute buy-hiiiiiiiiiy”) from 1977’s Point of Know Return, was, I think, appropriately criticized by Charley Walters, in The Rolling Stone Record Guide (1979), as “sophomoric philosophizing” (p. 200), and therefore appropriately pastiched, years later, in Bill & Ted’s Excellent Adventure (1989). The doom-laden “Dust in the Wind” remains the band’s most popular song, although to my taste the band’s best album from those first six years is Song For America (1975, cover art pictured), which I think also contains the best side (side 1) of music they ever recorded: “Down the Road,” “Song For America,” and “Lamplight Symphony,” all written or co-written by guitarist/keyboardist Kerry Livgren. His departure after 1980’s Audio-Visions dealt the band a serious blow. Kansas’ first album was released the year, 1974, I enrolled at the University of Kansas (not as a true freshman, however). That fall was the first I heard of the band, as it played a free concert in Lawrence coinciding with the beginning of the semester. Given that the band was from Topeka, the state capital, just down the road from Lawrence, it was, as the saying goes, a “big deal” for them to play a concert locally. The apparatus supporting bands such as Kansas (and Pink Floyd, and so on) was the technology of the synthesizer, the modern recording studio, and FM radio. In the late Sixties and early Seventies, FM radio defined itself by its high brow opposition to Top 40 (“teen,” that is commercialized, music). FM radio was, then, the place to go for more “serious” music, whether that was psychedelic surrealism (called “head” music at the time) or lengthy jams by West Coast bands such as Quicksilver Messenger Service and Jefferson Airplane. And that’s just it: FM radio supported, even encouraged, the extended, “orchestral” arrangements by bands such as Kansas. Most certainly Kansas wrote short songs purposefully designed as hits for Top 40 radio (“Down the Road,” as well as the aforementioned “Dust in the Wind”), but the band’s forte was extended compositions and classically styled arrangements. The band’s arrangements, in contrast to its compositions, were always its strongest suit. In this sense, it drew, as did many bands, from the brief but fruitful interchange between the classical and pop worlds.